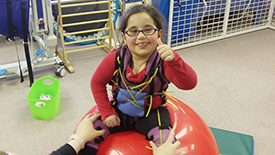 Euro-Peds is a nationally-recognized intensive pediatric physical therapy center treating patients with gross motor disorders including cerebral palsy, traumatic brain injury, spina bifida and a variety of syndromes. 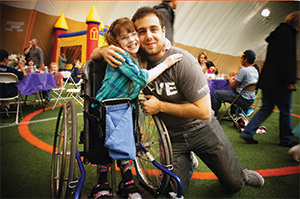 Through intensive bouts of individualized, one-on-one therapy sessions, children with all levels of involvement can -and do- learn new skills such as sitting, crawling, and walking to improve mobility, self-esteem and independence. Working with all ages, Euro-Peds' speech and language pathologists evaluate, diagnose and provide intervention for a variety of communication disorders. Learn more here. Euro-Peds also offers adult PT services for neuro-muscular and orthopedic conditions. We know caregivers of all ages need to focus on self-care. It’s vital to their job, and we're here to help. Explore how now! Join Michelle Haney, PT, MSPT, Director of Euro-Peds National Center for Intensive Pediatric Physical Therapy to learn more about this unique and successful treatment option. Easily accessible. Euro-Peds is conveniently located behind the Marriott Hotel off Opdyke Rd. near I-75 and Square Lake Rd. Pictures, Raffle Winner and more from this successful event!